According to a PwC global economic crime survey (2009), fraud has become a billion-dollar business that is increasing every year. That is, up to 30% of companies worldwide have been victims of fraud in the past years. The traditional definition describes fraud as involving “one or more persons who intentionally act secretly to deprive another of something of value, for their own benefit.” In recent years, the development of new technologies has provided further ways in which criminals may commit fraud. Perhaps paradoxically, new information systems may present additional opportunities to commit fraud. We argue that fraud is not often something an individual would commit by himself, but it is a well-considered and carefully organized crime set up by groups of people loosely connected to each other. Although all analyses focus in the first place on fraud detection, the emphasis of our research shifts towards fraud prevention, i.e. detecting fraud before it is even committed. As fraud is a time-evolving phenomenon, the challenge is to keep ahead of new types of fraud and to adapt to changing environment and surrounding effects. Hence, the use of networked data in fraud detection becomes increasingly important to uncover fraudulent patterns and to detect in real-time when certain processes show some characteristics of irregular activities. 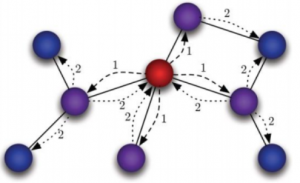 In contrast to traditional predictive data mining techniques, the research domain of social network analysis focuses on the interrelationship between customers to obtain better insights in the propagation of e.g. marketing campaigns, customer churn and retention, and fraudulent behavior. Customers directly and indirectly influence one other. Lots of valuable data and information is hidden in the underlying network structure connecting customers to each other. Our research team is specialized in analyzing networked data for fraud detection. One of the applications developed for individual fraud detection is Gotcha!, a network-based detection approach that combines insights for traditional fraud detection models with network knowledge. The network is explored for irregularities and measures the extent to which each individual is exposed to fraudulent influences. While most detection approaches are static in nature, Gotcha! exploits dynamic graphs, weighing fraud and the strengths of relationships between individuals over time. Rather than focusing on individual fraud, many businesses are struggling with the detection of illegal setups of fraudsters. This is also known as a web of fraud. In credit card fraud, for example, it is often a group of fraudsters that is responsible for the theft and malicious use of credit cards. Our team has developed Gotch’all! in order to identify and curtail fraudulent setups using the network among individuals. Furthermore, within a group different roles can be assigned to each individual, positioning and prioritizing the fraudulent effect that each individual has in the group.